If you thought reality TV was getting boring these days, you should hop in your time machine and go to the year 2057. In this dystopian future, jails are so overcrowded that the government decides to let criminals fight it out in futuristic armoured vehicles, while the bloodthirsty population watches on. In the game, you’ll play a convicted felon and fight for your life through several arenas. 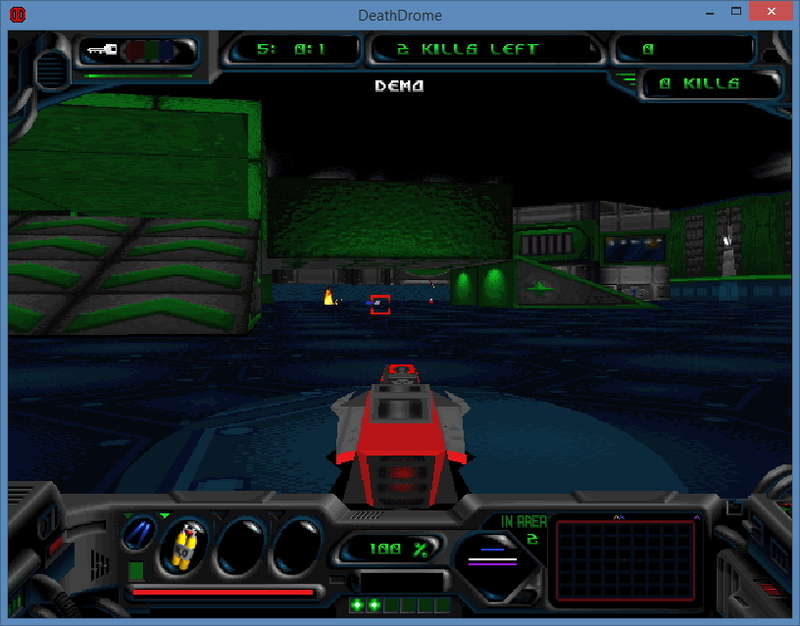 While the game should install just fine on 32 bit versions of Windows, Death Drome is yet another game with a 16 bit installer program, meaning it cannot be installed on 64 bit versions of Windows. To work around this problem, we have produced a replacement installer which you can download here (link broken? Let me know here). Simply run the installer after downloading it and make sure your Death Drome CD is in the drive, the installer will then take care of all the rest. 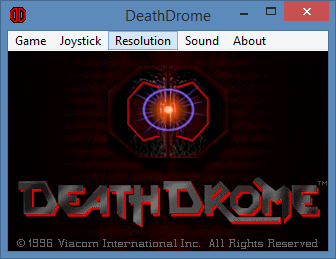 With Death Drome installed, start the game from the Start menu or Start screen by searching for “Death Drome” and clicking on the icon that appears. The following window should then appear. Click on the “Resolution” menu and choose “640×480”. The game will warn you that you need at least a 166mhz PC, but of course any modern PC easily eclipses that. You will need to configure this setting every time you start the game. There’s nothing else to do here, so click on the “Game” menu and choose “Start”. The game should then launch and begin its intro (press Escape if you want to skip). If it crashes back to the desktop, follow the steps under “Fixing compatibility problems with DXWnd”. There’s just one setting you can change to tweak visual quality, from the games main menu, choose “Options…”. You should then see an option for “Graphic Details”, ensure this is set all the way to “Max”. Death Drome has a CD audio soundtrack, this should work in modern versions of Windows as long as your CD is in the optical drive that is first alphabetically. For instance if you have two optical drives (including emulated optical drives such as Daemon Tools) with drive letters E: and G:, your Death Drome CD must be in drive letter E:. You may find that, while playing the game, the CD audio soundtrack doesn’t loop correctly, leaving you without any music in the middle of the game or in the games menus. If this bothers you, you can use the _inmm tool to correct the problem. Simply follow the tutorial here. The executable file that you need to patch is called “ddrome.exe” and can be found in the “RUN” sub-folder within the main Death Drome (DDrome) program folder. After patching the game with _inmm, the CD audio might be rather quiet. You may need to use the options menu to increase game music and decrease sound effects to compensate. 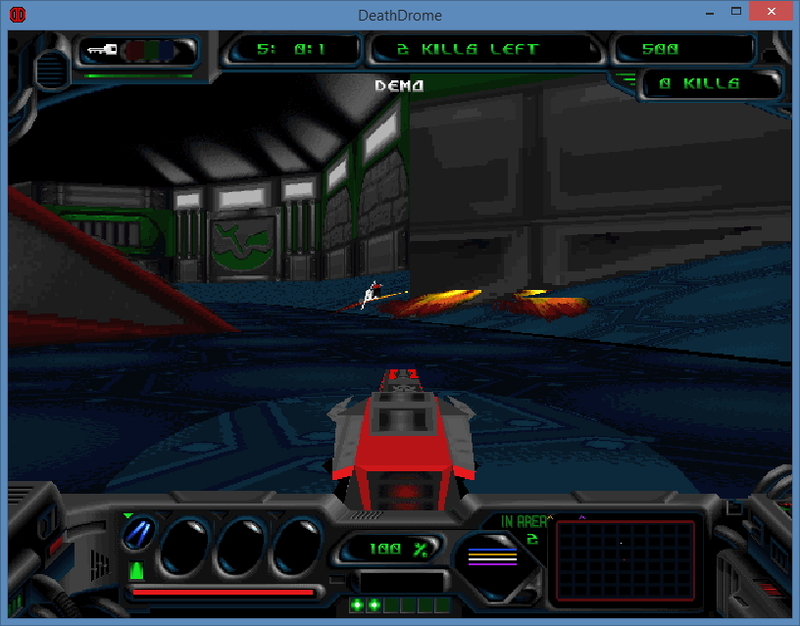 For such an old game, Death Drome actually works really well with modern controllers. There are a few caveats though. First of all, you cannot assign acceleration and braking to the analogue triggers on your gamepad. This means you will have to use up and down on the left analogue stick to move around. In practise this isn’t terrible, but it’s certainly not as comfortable as it could be. Secondly, the game only reads the first six buttons on any controller. If you need to define a button that the game cannot recognise, a tool such as Xpadder, that maps joystick buttons to key presses, can be useful. If you have access to Xpadder you may want to bind the cursor keys to the controllers D-pad and the Enter and escape keys to suitable buttons to allow you to navigate the games menus. We found that the game would not run on our Windows 8 PC without using the DxWnd compatibility tool. DxWnd was originally conceived as a tool for running games in a window, but has actually grown into a useful program for all kinds of troubleshooting. During testing we found that the latest version of DxWnd had a strange problem with the game where the games intro and menu screens would be drawn in a tiny square in the top left hand corner of the monitor. We’ve reported this issue to the author of DxWnd and he has promised to look into it for us. Testing the game with an earlier version of DxWnd (we used version 2.2.76) everything ran correctly. You can download any build of DxWnd from the Sourceforge page here. Having two or more different versions of the program won’t cause any problems on your PC unless you try to run them at the same time. Download DxWnd and follow our tutorial here in order to use it. You will need an export file for this game, which you can download here. Our export file is configured to run the game in full screen, you can easily change this back to Windowed mode by modifying the profile (as per the tutorial) and selecting “Run in Window” and deselecting “Fullscreen only” on the “Main” tab. If you followed the DxWnd tutorial correctly, the game should now start and not crash back to desktop as long as DxWnd is running too. The single player opponents in Death Drome are a little tame, so you might want to try the games multiplayer modes. While we haven’t tested this, the game is supported by the Kali.net tool, which you can download here. There is also a small fan-forum for the game which you can visit here. Thank you for this guide. It’s nice to see that such a classic arena shooter still gets its recognition and playability. Thank you, I was searching this game from 2000, this post bring me back to my childhood. How do you install the game if you don’t have the cd?